There are many times when the doctor prescribes to get platelet count done for patients. Normal platelet count is always a good sign and signals that you are healthy. But to understand normal platelet count, you have to first understand what platelets are and what their functions in the body are. Platelets are also known as Thrombocytes and they are one of the most important components of blood. The main function of platelets is to reduce and ultimately stop bleeding by clotting and clumping blood vessels post injuries. When blood vessels get damaged in an accident, they send out signals which reach the platelets and they help in clotting the blood. Along with the white and red blood cells, platelets are made in the bone marrow only. Now that you know what is platelet and what function it has, it is time to know the normal platelet count and how high or low count is not good for the system. 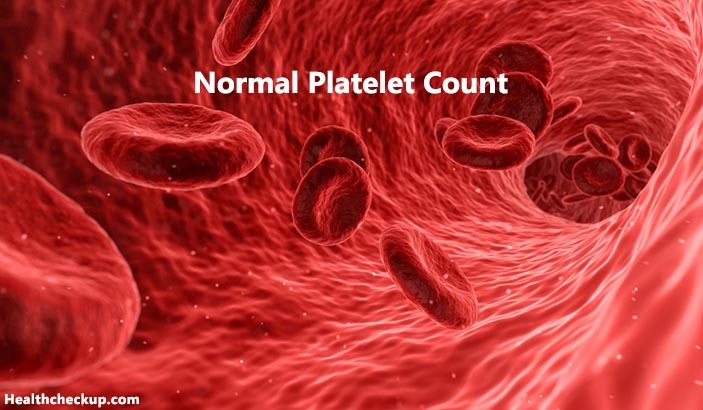 What is Normal Platelet Count? The range of normal platelet count is from 1, 50, 000 to 4, 50, 000 platelets per micro liter of blood. This platelet count stands valid for both genders and for people in all age groups. If a person has more than 4, 50, 000 platelets, he is suspected to be suffering from a condition known as Thrombocytosis. Again if a person has lesser than 1, 50, 000 platelets, the condition is known as thrombocytopenia. To measure the platelet count, one has to carry out a routine blood test which is known as complete blood count or CBC. Even if you get normal platelet count in the result, it is recommended to repeat the test at regular intervals and keep a track on the results. In case there are any problems taking place in the body, it will first be reflected in the platelet count. This is the reason that doctors prescribe complete blood count test before other tests and investigations. There are innumerable low platelet count causes. There are many substances and medications that lead to low platelet count. Again, there are many medical conditions which are responsible for low platelet count. The causes vary from one individual to another and have to be addressed likewise. Medical problems that lead to lower platelet count include anemia, leukemia as well as other kinds of cancers, sepsis, viral infections including hepatitis C and HIV, acute respiratory distress syndrome etc. In many cases, it has been seen that during pregnancy the level seems to drop down below normal platelet count. This happens due to the many hormonal changes that take place in the body during pregnancy. However, in this case, the count levels return to normal with time and no special treatment is required for the same. How to Increase Platelet Count Naturally? Low platelet count is an alarming sign and needs immediate attention for sure. People whose platelet count is lower than 1, 50,000 should be worried and be looking for ways as for how to increase platelet count naturally. With some simple home remedies and lifestyle changes, it is possible to push up platelet count and take it up to normal levels. Consult a doctor and know about the quantity that would be just right for you to increase the platelet count. It is important that you know the risk of low platelet count if your levels are lower than normal platelet count. Usually, people with low platelet count will bleed profusely even from a small injury as the blood will not clot in the way it should. It takes time for the blood to clot and meanwhile blood loss will take place. In major injuries or during surgery, low platelet count can prove to be fatal. Moreover, low platelet count might also be a signal for some dangerous diseases that are making a home in the body. Get to a doctor and know about how to maintain healthy and normal platelet count for a healthy life. Can Blood Clot Cause High Blood Pressure? What To Expect After a Blood Transfusion? Is It Possible To Reverse Diverticulosis Completely?